The meat industries of the United States have many negative effects on citizens health and over all well being. Meat production is a main contributor to global warming. Cattle farms release millions of tons of methane and CO2 every year.The United Nations Environment Program's Unit on Climate Change tells us, "There is a strong link between human diet and methane emissions from livestock." Livestock release 16% of Earth's annual production of methane.According to the magazine, Physics World, "The animals we eat emit 21 percent of all the CO2 that can be attributed to human activity." Eating meat and global warming are therefore directly related. On top of that, deforestation has increased in order to make cow pastures. In the process of deforestation, more greenhouse gasses are released. The trees that filter out CO2 of our atmosphere are also being eliminated. Going vegetarian or vegan is one of the most effective ways to combat global warming. In 2006 the United Nations report discovered that the meat industry emits more greenhouse gases than all the SUVs, cars, trucks, planes, and ships in the world combined. these Greenhouse gases such as methane C02 and nitrous oxide cause global warming. And global warming will cause catastrophes such as droughts, floods, hurricanes, and rising sea levels. Many people like me are trying to purchase fuel efficient cars like a Toyota Prius and put florescent bulbs in our houses. We are all trying to cut back on our emissions. But everyone else could do a lot more if they went vegetarian or just give up meat every other day. The Environmental Defense says that if every American replaced a meal consisting of chicken with a vegetarian dish, the C02 emission savings would equal that of taking more than 500,000 cars off roads in the United States. The University of Chicago states that going vegan is 50% more effective than driving a hybrid. Eating a pound of meat emits the same amount of greenhouse gases as driving an SUV 40 miles. Animal agriculture is also the leading source of emissions of nitrous oxide and methane. Billions of animals are packed into farms and emit vast amounts of methane. Methane is created while digesting and defecating. Methane is about 20 times as good at keeping heat in our atmosphere as C02. Environmental Protection Agency statistics tell us that animal farms emit more methane than anything else in the United States. The U.N. says that the meat, egg, and dairy industries emit 65 percent of worldwide nitrous oxide emissions. Nitrous oxide is about 300 times as good at retaining heat as C02. Medical Research Council in Cambridge, UK states that "Up to 80% of breast, bowel and prostate cancers are attributed to dietary practices, and international comparisons show strong positive associations with meat consumption. Estimates of relative risk obtained from cohort investigations are in the same direction, although generally weak, and red and processed meats rather than white meat seem to be associated with elevated risk of colon cancer. In breast cancer, there are consistent associations with total meat intake and there is evidence of a dose response." It can take up to five days to digest meat. Putrification is likely to happen inside of you. Undesirable bacteria will grow in your intestines and this might lead to disease. If you eat a plant based diet (like me), all that you eat will be gone within 24 hours.Therefore there is hardly time for an infection to occur. Studies have shown that animal protein increases blood cholesterol levels, while plant protein reduces it. 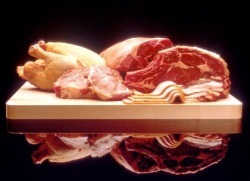 Cholesterol found in meats are more damaging to the circulatory system than cholesterol itself. Countries with high protein consumption have horrible rates of osteoporosis. The disease is rare in poorer nations that cannot afford milk or meat. Overall, meat contributes to a lot of the negative things in our society. It can be changed though! It can be changed by people like you and me. Duff, Cameron. "Long-Term Effects of Meat Eating." Innvista. June 1, 2007. Innvista. 11 Dec 2008 <http://www.innvista.com/HEALTH/nutrition/diet/vmeat.htm>. Bingham, Robert. "High-meat diets and cancer risk.." Meat and poultry. May 2, 1999. Anti-aging guide 2007. 11 Dec 2008 <http://www.anti-aging-guide.com/41meat.php#13>. Pierce, Andrew. "Fight Climate Change with Diet Change." Goveg.com. October 28, 2005. Goveg.com. 11 Dec 2008 <http://www.goveg.com/environment-globalWarming.asp>. Brook, Dan. "Meat is a global warming issue." Alternet.org. August 24, 2006. Alternet. 11 Dec 2008 <http://www.alternet.org/environment/40639>. Becker, Max. "Veggies Rock!." Current.com. October 29, 2007. Current Television. 11 Dec 2008 <http://current.com/items/76384362/veggies_rock.htm>.